America’s lowest-paid workers have lost nearly a full year’s pay since Congress last raised the federal minimum wage a decade ago. Every day, these workers’ losses continue to mount. Inflation has steadily eroded their pay, and as a result, a full-time, year-round worker earning $7.25 per hour will take an effective pay cut of $2,578 this year alone. 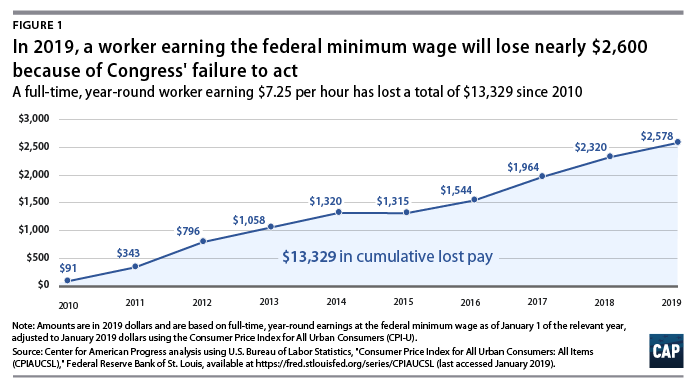 * Over the past 10 years, lawmakers’ refusal to act has cost America’s lowest-paid workers a total of nearly $13,330—just shy of the $15,080 that a full-time worker earning $7.25 per hour takes home annually. Today, minimum-wage workers would need more than 44 extra working days each year just to make the same in real terms as they did back in 2009, when the wage was last increased. As a consequence, this year’s Minimum Wage Workers’ Equal Pay Day—which marks the day on which minimum-wage workers finally catch up to their 2009 earnings—falls on March 7, 2019, more than nine weeks into the new year. Lawmakers should take advantage of strong support from voters on both sides of the aisle to abolish this unhappy anniversary once and for all by passing the [federal] Raise the Wage Act of 2019. To check the status of the seperate Illinois minimum wage bill go to https://goo.gl/rg8NZD. *Author’s note: For more information on the author’s methodology, see last year’s column on Minimum Wage Workers’ Equal Pay Day. Next Why Is the Political Establishment So Afraid of Ocasio-Cortez’s Green New Deal?